The Tupolev Tu-143 Reys (Flight or Trip, Russian: Рейс) was a Soviet unmanned reconnaissance aircraft in service with the Soviet Army and a number of its Warsaw Pact and Middle East allies during the late 1970s and 1980s. It contained a reconnaissance pod that was retrieved after flight, and from which imagery was contained. The Tu-143 was introduced in 1976 and strongly resembled the Tu-141, but was substantially scaled-down. It was a short-range (60–70 kilometer) tactical reconnaissance system and had low-level flight capability. The Tu-143 was truck-launched with JATO boosting, recovered by parachute, and powered by a TR3-117 turbojet with 5.8 kN (590 kgf, 267 lbf) thrust. The initial version carried film cameras, but later versions carried a TV or radiation detection payload, with data relayed to a ground station over a datalink. Some 950 units were produced in the 1970s and 1980s. The Tu-143 was used by Syria in reconnaissance missions over Israel and Lebanon during the 1982 Lebanon War, as well as by Soviet forces in Afghanistan during the Soviet–Afghan War. 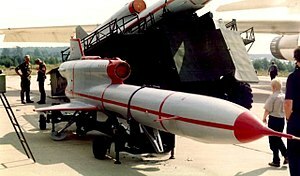 A target drone version, the M-143, was introduced in the mid-1980s. The Tu-143 was followed into service in the late 1980s by the similar but improved "Tu-243 Reys-D", with a 25 cm (10 inch) fuselage stretch, to provide greater fuel capacity and about twice the range; it had an uprated TR3-117 engine with 6.28 kN (640 kgf, 1,410 lbf) thrust; and improved low-altitude guidance. Since 1995, Tupolev began promoting the further refined "Tu-300 Korshun", which resembles its predecessors but is fitted with a nose antenna dome and nose fairings for modern sensors and electronic systems. It also features a centerline pylon for a sensor pod or munitions. Financial issues forced a halt to development at the end of the 1990s, but work was resumed in 2007. ^ "Воздушные мишени – вторая жизнь зенитных ракет — ОРУЖИЕ РОССИИ, Информационное агентство". Arms-expo.ru. Archived from the original on 2011-10-25. Retrieved 2013-09-03. Wikimedia Commons has media related to Tupolev Tu-143. This page was last edited on 12 January 2019, at 18:33 (UTC).